An edge-of-your-seat adventure book filled romance, adventure and brimming with vengeance. Angelo Crapanzano comes up with a story of how one peaceful, righteous and simple man can become a furious incarnation of vengeance due to aggravating circumstances in his new book, “Notorious Casolini.” Readers will get to know the different sides of the protagonist, Peppino Casolini, as the story progresses: from a gentle and righteous farmer to the embodiment of vengeful fury. The book will definitely put readers in eager anticipation at every turn of the page, wanting to know how Casolini’s dish of vengeance will be served: searing hot, or biting cold. “Notorious Casolini” is a book inspired by real events, per Angelo Crapanzano. The story is set in Sicily, specifically in the city of Barrafranca, in the early 1900’s. The story is fittingly set in the era where there is a transition in the government due to the recent unification of Italy. Barrafranca can be described as a peaceful, idyllic and developing city where Peppino Casolini and his family lives. The story unfolds with Peppino going about his simple life as a farmer. All seems to be going well until the event where Peppino’s beautiful younger rejected the advances of the ruling mayor of the city. Oppression and devastation rained down on Peppino’s family as a result of that event, bringing along a deadly outcome for Peppino’s family. The story progresses with the awakening and transformation of Peppino from a gentle farmer into a raging instrument of vengeful justice. The book also gives readers a warning not to scorn a peaceful man and unleash a beast of vengeance from within him, just like in Peppino Casolini’s case. The ruling class oppressors mistakenly thought that Peppino would always stay beneath their feet and not do anything. They were wrong. Peppino rose up against them, with a vengeful fury they never expected. Another warning: don’t make false assumptions. 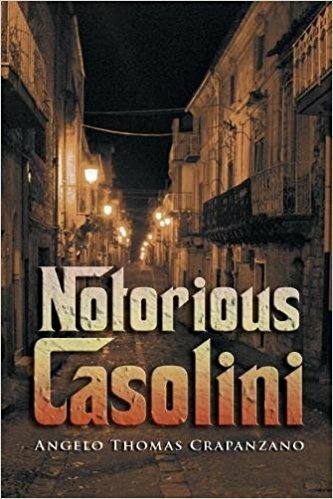 “Notorious Casolini” is a guaranteed exciting book from start to finish. It has the perfect blend of love, action, and adventure, set to complement the thematic backdrop of vengeance and justice. Get a hold of this exciting book in the upcoming 2018 Frankfurt International Book Fair which will be happening on October 10, 2018. Angelo Crapanzano is a full-time writer who retired as Manager of the Electronic Research and Development Department of an aerospace corporation. “Notorious Casolini” is his third Novel. He has written six novels. He is currently working on his seventh novel. It is not yet named. It is a romantic novel about two young lovers who had to overcome many problems to get together. Angelo lives with his wife of 65 years near Akron, Ohio.